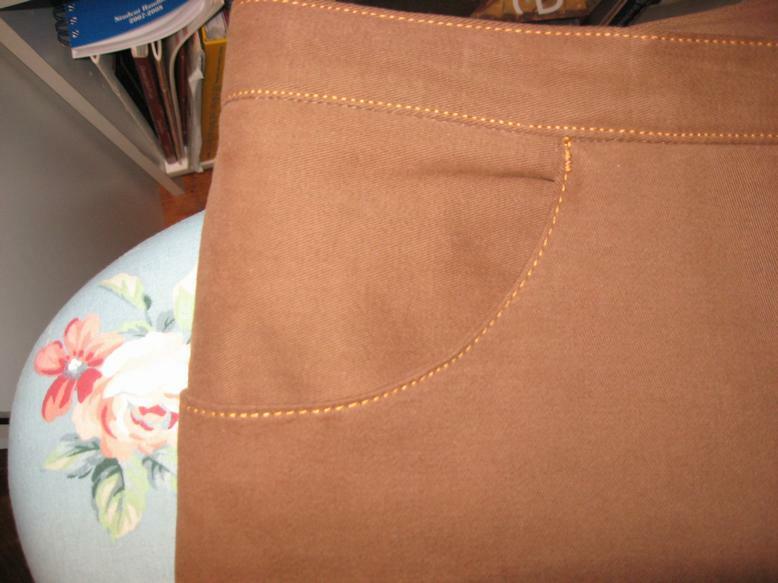 I spent yesterday afternoon and evening working on my brown sueded twill jeans and got them finished. I think they turned out great and can't wait to do the rest of the garments that go with them. The fit on this pattern is perfect in the front and the back. I feel so lucky to have a TNT jeans pattern that I can sew up any time I want. I certainly can't do that with RTW. The jeans topstitching thread looks really good on the brown twill. It took a size 19 needle to sew these pants, and even then I had to change the needle once because the needle got a burr on it. I don't know how, but the side seam got chewed up a bit when I was sewing so I had to make a larger seam so as not to have holes in my pants. 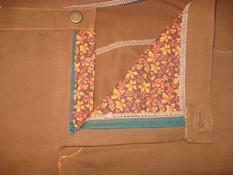 I really like how the quilting cotton gives these pants an Autumn look. I know no one else will be able to see the fall leaves and green zipper, but I like that I'll see it every time I take them off. It's just one of those things that make sewing for myself fun. I was too lazy to change my serger thread, but again, no one else will know, except you. Don't tell anyone, OK? Lorri and Keely asked me what was wrong with my Jalie Top that I posted about yesterday. Well, first of all, I recut the armhole on the front and back and cut a different sleeve for it. I forgot to take the "before" pictures. The top looked terrible because the back was showing draglines from my underarms to the neck area. Also, it sits on my back hip fluff even after I pull the top down. Before I recut, the sleeves were just weird looking on my arms. They fit at the cap, but were too tight at the hem for the cap length. I do like the top well enough to wear it now that I've sort of fixed it. It also has draglines from the bust to the waist in the front, which is more obvious from the side. I didn't get a picture of that either, sorry. Tonight I plan on sewing up my redraft of this pattern. This top is good enough to use as part of my SWAP. I'm not doing an official SWAP, but I'll use the pieces from my mini-wardrobe, adding other pieces I've sewn in the last few weeks and some things I will still need to sew. Maybe without the pressure of a SWAP contest, I'll actually get one done. 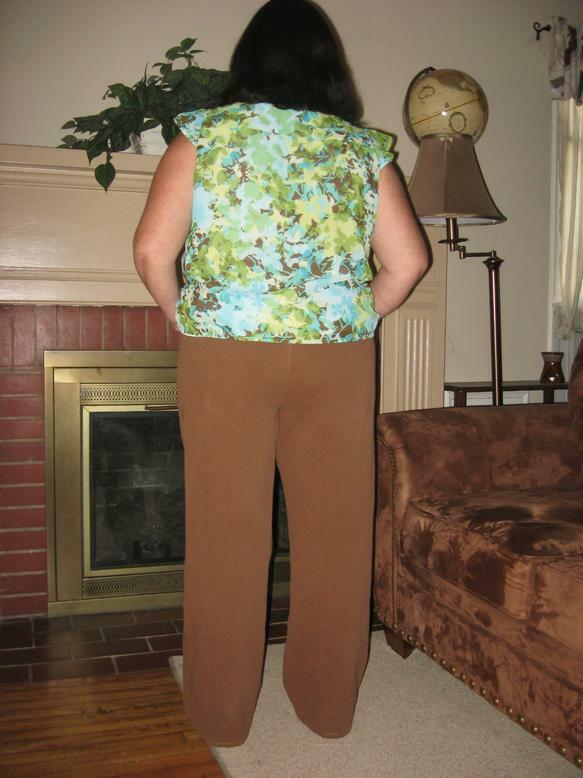 WOW - what a great job of fitting you did on those pants! Just a beautiful job. Thanks for taking the time and pix! 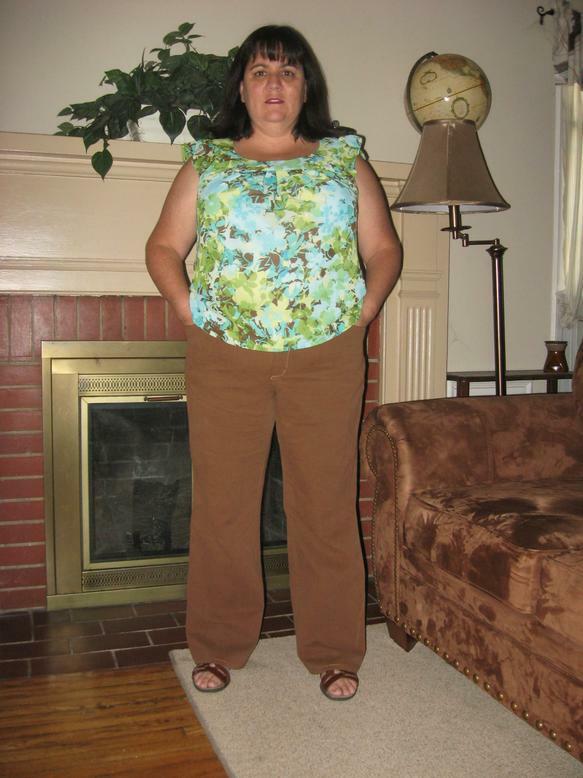 "Aunt Gail pr.com"
Love your jeans...great job! I'm sewing some myself. Pink/indigo denim with some lovely quilting cotton for the pocket lining and a fabulous rainbow zipper. Great minds, huh?! Great jeans! Which pattern did you use? Wonderful fit. And, I love the interior contrasts.